(Waldorf, Md., Feb. 14, 2018) - The Southern Maryland Blue Crabs have announced the signings of two Atlantic League newcomers. 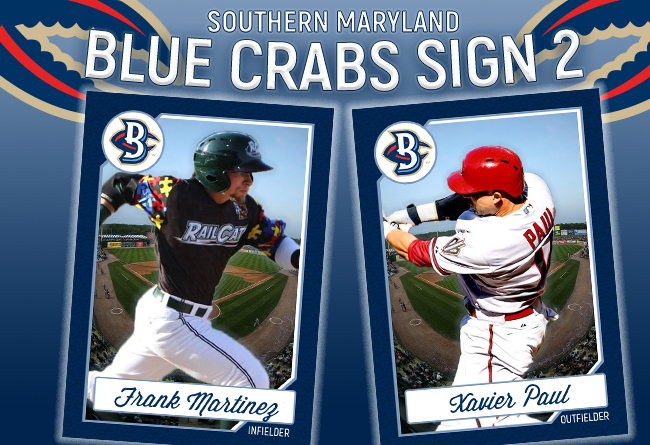 Former MLB outfielder Xavier Paul and infielder Frank Martinez are the latest additions to the roster as the team prepares for the start of the 2018 season. Paul joins the Blue Crabs with six seasons of Major League experience under his belt. The outfielder was drafted out of high school by the Los Angeles Dodgers in the fourth round of the 2003 MLB Draft. He worked his way up the Dodgers farm system, eventually making his MLB debut with the team in 2009. Paul appeared in 349 games over the next six seasons, spending time with the Dodgers, Pittsburgh Pirates, Cincinnati Reds, and most recently appearing in 2014 with the Arizona Diamondbacks. In his 14 professional seasons, the Louisiana native has posted a career .280 batting average, with 100+ homeruns and stolen bases. Martinez comes to Southern Maryland with 13 years of professional baseball experience. The utility infielder originally signed with the Oakland Athletics in 2004, joining their Rookie League affiliate. Martinez spent six seasons with the A’s organization, before making the jump to independent ball in 2011. The Dominican Republic native spent the next five seasons in the Frontier League, playing for three different teams in that span. He then joined the American Association, where he split 2016 between the Sioux Falls Canaries and the Gary SouthShore Railcats. The switch-hitter spent 2017 with Gary as well, hitting .275 in 88 games with the Railcats.